I’ve heard this is a classic as well as being a multiple award-winner and I can see that. I wish I’d read it when it came out, though – maybe the structure and the substance of the crime would have been more shocking, (I think that was the intent.) That said, I enjoyed the book. The frame story is set in 2001 or so with a journalist, Catherine Heathcote, who wants to write a true crime book about the 1963 murder of Alison Carter, a pretty 13-year old girl who lives in a rather backward village in England. Heathcote, who was raised not too far away at the same general time, remembers the story of Allison’s molester stepfather from when it happened. That pretty well lets the reader know this is not a who-done-it. The interior story, the main plot of the book, consists of the investigation (police procedural) and the trial (legal thriller) as it unfolded in the 1960s. But Heathcote is reinvestigating it all with interviews and so on – like “true crime” authors do. This is told primarily from the point of view of Detective George Bennett so it is in large part, a police procedural, but there’s a legal thriller aspect as well. 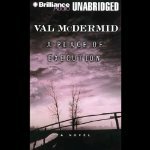 The plot has nice twists and turns – McDermid points the reader one way and then does a hairpin turn on that idea which morphs into something a bit more but – oops, we twist again. And so it goes. The setting is very well done – the teens of Scardale, Derbyshire of the 1960s are generally with the times, but the adults are a bit backward, ingrown, leery of outsiders and change. The characters are very nicely drawn, although there are so many I got confused a couple times. Because of the setting and the cop-shop ways of the ’60s, that aspect is a bit of historical fiction, but I wouldn’t classify it as historical crime – there’s not quite enough emphasis or detail on the historical for that.